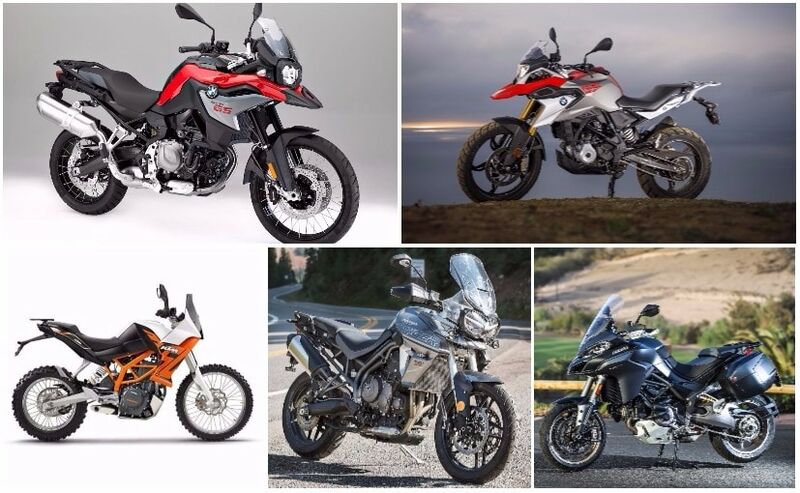 The year 2018 is going to be an interesting year for the adventure motorcycle space in India. Adventure bikes, or ADV bikes as they are also referred to, are seeing tremendous interest worldwide. And it’s not just the high-capacity, multiple cylinder big ADV bikes which have caught the fancy of motorcyclists across the world. Increasingly, more and more motorcycle lovers are seeking lightweight, fun-to-ride, adventure bikes which can take on rough terrain, and also double up as occasional touring machines. Here’s a look at the top 10 adventure bikes which are likely to make their way to India in 2018. Hero MotoCorp will introduce the successor to the Hero Impulse in 2018, called the Hero XPulse, which was unveiled at the 2017 EICMA show in Milan in November 2017. The Hero XPulse will be powered by a 200 cc, single-cylinder engine making around 20 bhp of maximum power, and the motorcycle will be lightweight, with a kerb weight of around 140 kg. The XPulse is expected to be launched in mid-2018 and will have a price tag of around ₹ 1-1.2 lakh (ex-showroom). Hero is expected to introduce the XPulse in two variants – a road-oriented variant and an off-road oriented version. BMW Motorrad’s baby GS will also be launched in India in 2018, along with the BMW G 310 R, the bike jointly developed with TVS Motor Company. BMW Motorrad India will launch both the G 310 R as well as the G 310 GS, the adventure sibling of the G 310 R, also referred to as the ‘baby GS’. The BMW G 310 GS will be powered by the same 313 cc, single-cylinder, water-cooled engine which makes 34 bhp at 9500 rpm, and 28 Nm of peak torque at 7,500 rpm. The G 310 GS will have styling inspired by BMW’s bigger GS models, and will have a 19-inch front wheel with long-travel suspension. The G 310 GS will have a maximum speed of around 140 kmph and is expected to be priced around ₹ 2.75-2.8 lakh (ex-showroom). KTM is also expected to introduce the much-awaited adventure bike based on the KTM 390 Duke, the KTM 390 Adventure, sometime in 2018. With KTM’s expertise in manufacturing dual-sport and off-road bikes, the 390 Adventure is expected to be quite well-specced in terms of off-road equipment. The engine will be the same 373 cc, single-cylinder unit of the 390 Duke which makes around 43 bhp of power at 9000 rpm and 37 Nm of peak torque at 7000 rpm. But expect the 390 Adventure to have a slightly different state of tune to have more torque lower in the rev range as well as different gear ratios suited for riding in the rough. Price is expected to be around ₹ 2.75 lakh (ex-showroom). DSK Benelli will be launching its middleweight adventure bike, the Benelli TRK 502 in 2018. The TRK 502 has already been launched in markets abroad but delays with homologation has pushed the bike’s India launch now to 2018. The bike is powered by a 500 cc liquid-cooled, parallel-twin engine tuned for 47 bhp of power and 45 Nm of torque. The motor will be paired to a 6-speed gearbox, and will come with studded tyres and spoked wheels. Expect the Benelli TRK 502 to be priced between ₹ 6-6.5 lakh (ex-showroom). Another middleweight adventure bike which will be making its India debut in early 2018 is the SWM SuperDual, which will be marketed by Kinetic MotoRoyale, which also sells MV Agusta bikes in India, and will also be introducing Norton motorcycles in India. The SWM SuperDual is a light-weight adventure bike powered by a four-stroke, single-cylinder 600 cc engine based on the old Husqvarna TE610 enduro bike. Also sourced from the Husky is the tubular steel chassis and the aluminium swingarm. The 600 cc engine makes around 54 bhp of power and 53.5 Nm of peak torque. There are no electronics to speak of though; no traction control, no riding modes, and no ride-by-wire. But what is offered is high-quality components – Brembo calipers, Sachs shock, Fast Ace forks, LED headlights and optional hard luggage, the SuperDual certainly promises a lot to the booming adventure bike market in India. Expect the SWM SuperDual to be priced just under ₹ 6 lakh (ex-showroom) when it’s launched in India. One of the most popular adventure bikes in India right now, the Triumph Tiger 800, will get a host of updates for 2018. The 2018 Triumph Tiger 800 range is expected to be launched in mid-2018. Updates to the Tiger 800 include sharper styling, all-LED lighting, a full-colour TFT instrument panel and with a choice of six riding modes. Also new will be an adjustable windscreen, new seat compound and high-spec Brembo brakes and Showa suspension. The new Tiger 800 will have a shorter-ratio first gear and a new Off-Road Pro riding mode in the off-road biased XC versions. The engine largely remains the same, but is expected to have more performance and will feature a lighter, and freer flowing exhaust. Expect prices ranging from around ₹ 13-16 lakh (ex-showroom). Triumph will also introduce the all-new Tiger 1200 in early 2018. Triumph has dropped the ‘Explorer’ moniker for the larger Tiger, which, so far, has been known as the Tiger Explorer. For 2018, the Triumph Tiger 1200, as it will be known, will get significant updates, including minor cosmetic updates, improved ergonomics, less weight and the latest self-balancing semi-active suspension. Also on offer will be up/down quickshifter, cornering ABS, improved electronics and adaptive cornering lights. The Tiger 1200 will be available in two variants – the road going XR range and the more off-road focussed XC versions. Expect prices to begin from around ₹ 20 lakh (ex-showroom). Ducati will also introduce its brand-new Multistrada, the Ducati Multistrada 1260, which gets a displacement bump with a 1262 cc DVT engine sourced from the X-Diavel with more torque across the rev range. According to Ducati, 85 per cent of the torque is available under 3500 rpm, and power delivery at 5500 rpm is 18 per cent higher than the outgoing Multistrada 1200. The new engine makes 158 bhp at 9750 rpm and 129.5 Nm at 7500 rpm. The silhouette of the bike remains more or less similar, but there are subtle changes to the design as well, with new side panels, new seat, and a host of electronics upgrades, now with a bi-directional quickshifter as well. Expect prices of the new Multistrada 1260 to be in the region of ₹ 20 lakh once the bike is launched in India. BMW Motorrad is expected to introduce two new middleweight adventure bikes in 2018. Both bikes are powered by the same parallel-twin engine, now displacing 853 cc, but with different states of tune. For the F 750 GS, the engine makes 77 bhp at 7500 rpm and 83 Nm of peak torque at 6000 rpm. The other difference in the F 750 GS are the wheels; the 750 gets 19-inch front, 17-inch rear cast alloy wheels. Power is transmitted to the rear wheel through a six-speed transmission through a chain, and now with the drive on the left-hand side. Both the F series GS bikes use a monocoque chassis and the 750 gets telescopic front forks, and come with standard Rain and Road riding modes along with ABS and traction control. Bodywork is redesigned as well, and instruments are full-colour TFT screens. The BMW F 850 GS is the more off-road oriented of the new BMW middleweight adventure twins. Like the 750 GS, the F 850 GS is also powered by the 853 cc parallel-twin engine, but it makes slightly more power, producing 95 bhp at 8250 rpm and 92 Nm of peak torque at 6250 rpm. Unlike the F 750 GS, the BMW F 850 GS gets wire-spoked wheels with a 21-inch front and 17-inch rear configuration. The front suspension is upside down on the 850 and the bike also gets optional riding modes like Dynamic, Enduro and Enduro Pro. So far, it’s not certain if BMW Motorrad will introduce both the F 750 GS and F 850 GS in India. From all indications, only the BMW F 850 GS will be introduced in India in 2018. Expect price to be in the region of ₹ 15-17 lakh (ex-showroom).